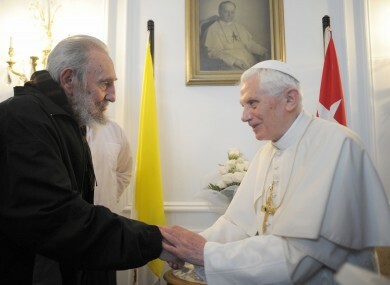 POPE BENEDICT XVI has met Fidel Castro in Cuba and delivered an unusually political sermon before hundreds of thousands of people. In the sermon, Pope Benedict demanded more freedom for the Catholic Church in communist-run Cuba and preached against “fanaticism” in front of a speech attended by Cuban president Raul Castro. Later, the president’s brother, revolutionary leader Fidel, grilled the pontiff on changes in church liturgy and his role as spiritual leader of the world’s Catholics, a Vatican spokesman said. Benedict’s homily was a not-so-subtle jab at the island’s leadership before a vast crowd of Cubans, both in the sprawling plaza and watching on television. But he also clearly urged an end to Cuba’s isolation, a reference to the 50-year US economic embargo and the inability of eleven American presidents and brothers Fidel and Raul Castro to forge peace. “Cuba and the world need change, but this will occur only if each one is in a position to seek the truth and chooses the way of love, sowing reconciliation and fraternity,” Benedict said. Benedict’s trip was aimed largely at building a greater place for his church in the least Catholic nation in Latin America. In his homily, he urged authorities to let the church more freely preach its message and educate its young in the faith in schools and universities. Religious schools were closed after the Castros came to power a half-century ago. During the 30-minute meeting between the pope and Fidel Castro at the Vatican’s Embassy, the retired Cuban leader — a one-time altar boy who was educated by Jesuit priests — essentially interviewed Benedict, asking him about the changes in church teachings since he was a child, what it’s like to be a pope and the challenges facing humanity today, said the Vatican spokesman, the Reverend Federico Lombardi. The meeting began with some jokes about their ages. Castro is 85, Benedict reaches that milestone next month. “Yes, I’m old, but I can still do my job,” Lombardi quoted the pope as saying. He described the meeting as serene, intense, animated and cordial. Email “Pope meets Fidel Castro in Cuba”. Feedback on “Pope meets Fidel Castro in Cuba”.